Your financial gifts to St. Peter’s make a difference in the breadth and reach of our ministries. 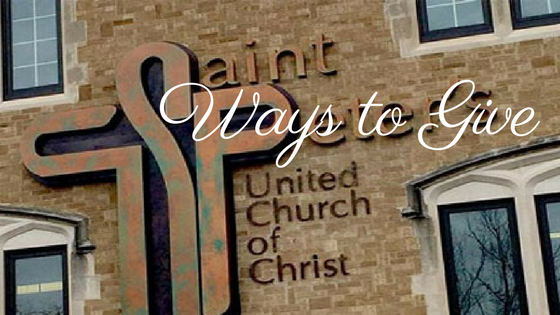 Below are suggestions for how you can make financial donations to St. Peter’s. Thank you for helping to support our church. If you would like to make a pledge, please click here and fill out form. Cash can be given during any of our services or brought to the church office during business hours. Place it in an envelope (there are envelopes in the pew racks in the sanctuary) and, if you wish, designate the purpose of your gift on the envelope and, optionally, your name. Use the check’s memo line to designate the purpose of your gift such as regular pledge, capital campaign, in memory of, etc. Most banks allow you to “pay bills” online, many without charge. You can also schedule recurring payments, e.g to pay your pledge monthly. To set up this capability, contact your bank or check their website. As with any other donations, you should designate the purpose of your gift such as pledge, in memory of, etc. Note that using Chase QuickPay provides the same capability and the transfers are all done electronically which is often quicker and involves no hard copy checks or mail delays. St. Peter’s offers an online capability to set up donations or payments, either as a recurring event or one time, using credit/debit cards or your checking/savings account via the Tithe.ly app or website. Donations can be for regular pledges or giving, Faith Forward or memorials. St. Peter’s incurs a small fee on all such donations but payments with credit/debit card incur an additional fee of about 2.90% + 30 cents. During the process to setup your donation or payment using a credit/debit card, you will have the opportunity to check a box which will add the fees to your donation. We encourage you to take advantage of this opportunity. Click here to give via Tithe.ly’s website. St. Peter’s now offers the capability to set up donations or payments, either as a recurring event or one time, using ACH transfer by using a paper Authorization Form. There is no cost to you or St. Peter’s when you use the ACH method, though please confirm this with your bank. To initiate donations or payments using the paper form stop by the church office or click here to download the form. Gifting stock or securities to St. Peter’s provides the church with the market value (less transaction fees) of the donated stock while potentially providing the donor the opportunity to avoid income tax on any gains represented by its appreciated value. You might also qualify for a tax deduction for the full amount of the donation when you file your annual tax return. For information about how to make the gift, please contact the church office. As with all tax related matters, always consult your personal tax adviser for implications specific to your situation.